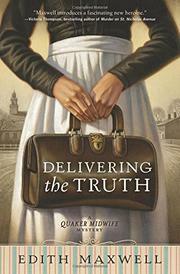 A 19th-century Quaker midwife discovers unexpected sleuthing talents. Rose Carroll lives with her widowed brother-in-law and his family in Amesbury, Massachusetts. Her beau, Dr. David Dodge, occasionally aids her in such difficult cases as that of Minnie O’Toole, an unmarried woman who refuses to name her child’s father. Another hard case is that of Lillian Parry, the spoiled, discontented, and much younger wife of wealthy carriage-factory owner William Parry, who’s neglecting her for a mistress. Rose’s peaceful life ends when arson destroys several of Amesbury’s carriage factories, kills several men trapped inside, and throws a large portion of town out of work. Detective Kevin Donovan asks Rose to keep her eyes open for clues to the arsonist as she travels around town but sternly warns her not to become too involved. But when William Parry’s son Thomas is stabbed and Rose’s hand-painted knitting needle is identified as the murder weapon, she refuses to heed Donovan’s warning and begins sleuthing in earnest. Among the people who give her sage advice is celebrated poet John Greenleaf Whittier, a fellow member of the Society of Friends. Rose’s own abilities and a bit of bad luck eventually bring her face to face with a killer. In a departure from her organic farming cozies, Maxwell (Farmed and Dangerous, 2015, etc.) goes back to 1888 to launch a new series combining a highly competent mystery with the requisite period detail.